Tell North Dakota Gov. Jack Dalrymple: Abortion is a Right! House Bill 1456, a so called "fetal-heartbeat" bill that passed in North Dakota's legislature on March 15th, is the latest and by far the most extreme in a series of attacks on our right to abortion. This law seeks to ban abortion for women in North Dakota as early as 6 weeks effectively stripping the right to abortion from millions of women in that state. This legislation is part of a wave of attacks against women's rights; it is no coincidence that it is coming on the heels of similar legislation that passed in Arkansas just a week prior. Insane, unscientific legislation like this is nothing short of an attempt to deny women our human rights. The right wing feels emboldened in their march to remove our right to control our own bodies. They are determined to send women back to the dark ages of back-alley abortions and legally sanctioned inequality. We must maintain the right to control our own bodies and our own lives. We must fight this legislation, for women in North Dakota and all over the United States! In response to this heinous legislation, WORD is calling on women all over the United States to send an urgent letter to North Dakota Gov. Jack Dalrymple. Please take a moment to complete a simple online form and urge Gov. 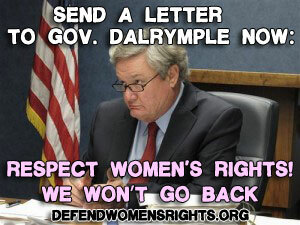 Dalrymple not to sign this bill into law.